In most scenarios, foundation failure is caused by the shifting of soil that is directly underneath a structure and its foundation. The movement of soil can be caused by a variety of factors. One of the most common throughout the nation is erosion. When the surface soil near or underneath a foundation begins to erode, it can potentially cause several problems for its structure. In this blog, we are going to review some of the dangers of soil erosion and its effect on foundations. 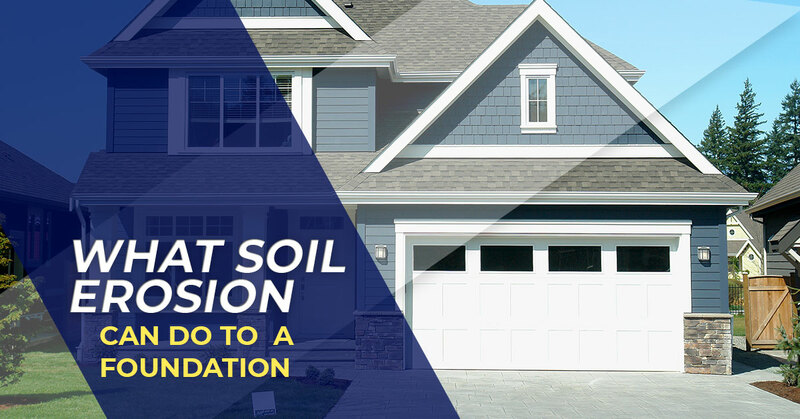 Many business owners and homeowners do not understand tor realize that the negative effects that soil erosion is not limited to agriculture, but that it can also cause foundation problems for their residential or commercial building. Soil erosion generally occurs when there is an excessive amount of rainwater or groundwater from different sources washing away the soil. This is most common on the surface of the ground when water washes the topsoil away. Even though the soil on top is being washed away, the soil beneath the surface of the ground can also be affected., especially after dry spells when the soil shrinks from lack of moisture, creating gaps and spaces for water to flow through. When the soil beneath the surface becomes erode, it forms voids that do not offer enough support for any foundations that are built above the surface of the ground. This will eventually lead to foundation settlement and sinking. Not only can the erosion of soil cause a foundation to sink and settle, it can cause water seepage and other issues to the structure. If enough of the surface level soil around your home is eroded away, it can create spaces and dips that allow water to collect and pool around the foundation. This water is more likely to leak through any foundation cracks or seep through porous concrete material, often creating some serious issues for buildings with basements. When your foundation repair company gets called to foundation repair jobs due to the erosion of soil, you’ll need quality products to make reliable foundation repairs. To provide a solution, various underpinning techniques and methods that can be utilized to help lift and stabilize a foundation that has shifted or settled due to erosion. Helical Piles. These are anchoring devices that are screwed into the surface under the foundation and is used to support and lift a settling foundation. Slab Piers. Slab piers are specialized types of helical piers that often are used for lighter-weight structures, such as concrete slab foundations or stoops. Steel Push Piers. Steel push piers work in a similar way to helical piers, except they are driven into the ground until they reach load-bearing soils instead of being screwed in. If you are interested in learning more about Magnum Piering’s high-quality products, contact our friendly representatives today!